Home / memphis may fire / reviews / Review || Memphis May Fire - "Broken"
Review || Memphis May Fire - "Broken"
When it comes to reviewing new albums, I always try to approach them with a very open mind, give the album a few spins while taking notes on the songs and, when I have a foundation, start writing as the album is playing to keep me inspired. Sometimes this happens in 30'; sometimes it takes 3 days for me to come up with an integral opinion. 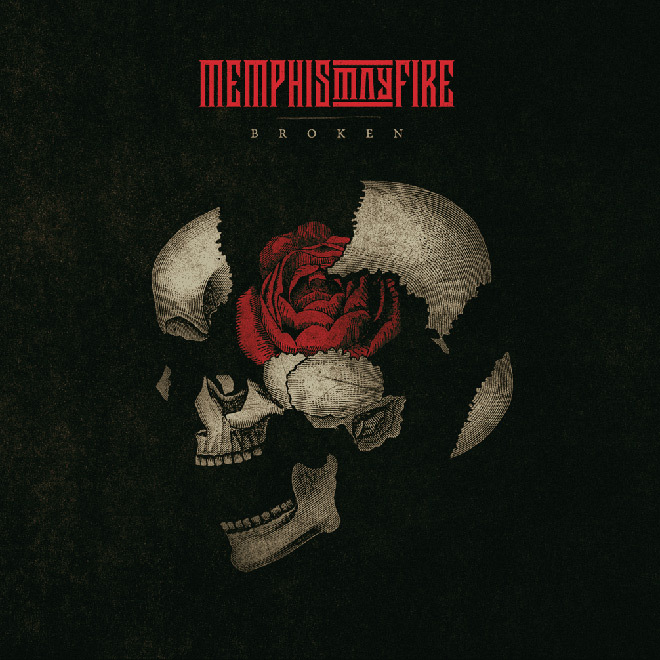 "Broken", the latest record of Memphis May Fire, belongs in the second category. Released on November 16th via Rise Records, it's the band's 6th studio album. The album is pretty far from what the average fan would expect. How far? To an alienating degree, I'm afraid. The band took a left, low-key pulling an Of Mice & Men, and created their most baffling work to date. We recently discussed who is holding the metalcore spirit alive in 2018 and, if you asked me, Memphis May Fire would have made it to the list. We have also discussed, on multiple occasions, how age and the expansion of music taste for musicians leads to diversity in the creation of music. I think "Broken" falls right in between. The band teased the impending shift of sound with the single "The Old Me", which is a pretty catchy song and good single material. The prominent use of clean vocals should have been a dead giveaway but I guess we chose to ignore the signs for temporary happiness. What we are witnessing here is the pathogeny of a sinking ship. We can identify the root of the problem as follows; the scene that raised you to your status is slowly but quite steadily declining yet still producing new bands, but your old fanbase is starting to grow out of it as life and adulthood get in the way. A change in the sound and overall direction is usually the last resort that could make or break a band. Sometimes it works out (e.g. with OMAM; a lot of people -myself included- considered them done even before the departure of Austin Carlile but their recent work proved us wrong and the band is at the top of their game) but sometimes it doesn't. I don't want to say that "Broken" is a bad or "sell-out" album, because it is not. You can see the effort that went into it lyrically and musically, plus the quality of the production is stellar, as details are shining through the songs. The problem is that the more "commercial" viewpoint introduces a full sound, big choruses and a dull, almost uninspired and emotionless outcome that doesn't seem to reach a peak. Even when there's solid compositions like the lead single, "Fool", or the ballad "You & Me", there's songs like "Sell My Soul" with a Marilyn-Manson-meets-grunge aesthetic, or the collaboration with hip hopper Andy Mineo on "Heavy Is The Weight" that makes the listener question the incentive behind them. Finally, the transition from screams to clean vocals is a very fortunate event and a winning move, as Matty Mullins is a very versatile performer with a golden singing voice. Overall, "Broken" didn't do the trick for me and, in a way, it left me with more questions than answers. It was a risky move to pull and I sincerely hope it pays off eventually. This generic alt metal(core) transition/evolution gave me a bitter aftertaste and a feeling of panic from the band's end. If it fails to get critical reception, it will be a huge blow in Memphis May Fire's carer. There's no doubt that very few artists can still hold their ground while being original. Whether this album is an opening to a wider, more radio-friendly audience or the band's swan song, remains to be seen.